As the morning people we are we got up at 6 am, put on our hiking gear and left in our prebooked taxi with destination Jinshanling, a 2,5 hour drive. We were a bit worried for the views since it was very foggy in the morning, but when we arrived in Jinshanling the sun came through. We had to argue a bit with both the driver and all the “local experts” regarding our route, because we wanted to take the long hike and they tried to convince us to take the shortest route using the cable car. We did it our way and walked the westernmost path to the wall, and even walked further east from there to see the view from The West Tower with Five Holes. On a clear day you should be able to see the Simatai range from here, but we had some haze and couldn’t see quite that far. We walked back east to the Zhuandou pass where we started and continued east from there towards Simatai. 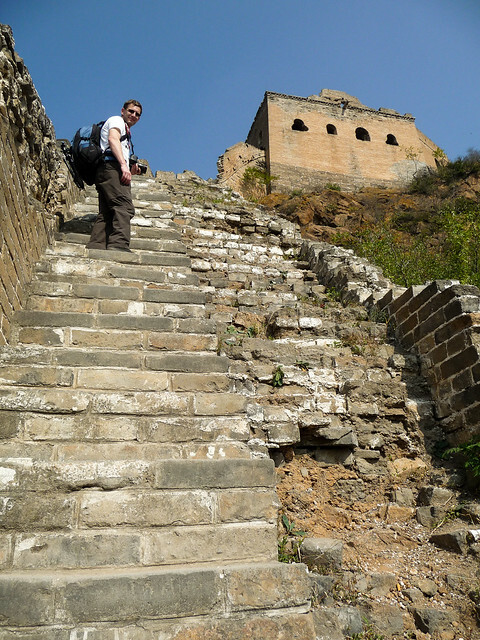 A few other tourists had entered the wall by now, but most of them went back down to Jinshanling using the cable car. The wall close to Jinshanling was restored in the 80’s but after an hour of hiking most of the wall was in it’s original condition. Still we only had to leave the wall shortly on two occasions to get around areas/towers that were not secured. One of the reasons we started early was to beat the crowds everyone was telling us about. We knew that this part of the wall was probably not as busy, but having the wall pretty much to ourselves was not expected. We met a couple of other groups doing the hike, talked a bit to some people from New Zealand and also shared experiences with a dutch couple walking in the opposite direction. The haze disappeared slowly during the day, the sun got warmer and warmer, the wall got steeper and steeper and the views were absolutely amazing the whole way. By the time we reached the highest point we were sweating in shorts and t-shirts, our legs were a bit sore, our cameras were running warm but we were still smiling from ear to ear. We enjoyed our lunchbox from the hotel and started our climb down to Simatai. This part of the wall was not as hard as the first part but it was still some steep climbs both up and down. Just before arriving in Simatai we heard some thunder, but we had time for both t-shirt shopping and a beer before the rain came. By the time we arrived at the hotel we were too tired to go out for dinner, so we went to the Italian restaurant at the 20th floor of our hotel. We were quite hungry after a long day and enjoyed a three course dinner with the views of Tiananmen Square. Heia. Det høres jo helt fantastisk ut. Må være i litt god form, skjønner jeg. Ser ut til å være en fargerik vegitasjon langs muren. Er impornert over alt forarbeid dere må ha gjort. Her er det et vakkert høstvær med 8 grader. God tur videre. Mange hilsner fra I-A.